In the past few months, I’ve posted about two works of long-form scholarship on the Quantified Self: Debora Lupton’s The Quantified Self and Gina Neff and Dawn Nufus’s Self-Tracking. Neff recently edited a volume of essays on QS (Quantified: Biosensing Technologies in Everyday Life, MIT 2016), but I’d like to take a not-so-brief break from reviewing books to address an issue that has been on my mind recently. Most texts that I read about the Quantified Self (be they traditional scholarship or more informal) refer to a meeting in 2007 at the house of Kevin Kelly for the official start to the QS movement. And while, yes, the name “Quantified Self” was coined by Kelly and his colleague Gary Wolf (the former founded Wired, the latter was an editor for the magazine), the practice of self-tracking obviously goes back much further than 10 years. Still, most historical references to the practice often point to Sanctorius of Padua, who, per an oft-cited study by consultant Melanie Swan, “studied energy expenditure in living systems by tracking his weight versus food intake and elimination for 30 years in the 16th century.” Neff and Nufus cite Benjamin Franklin’s practice of keeping a daily record of his time use. These anecdotal histories, however, don’t give us much in terms of understanding what a history of the Quantified Self is actually a history of. I hope you’ll stick around for the full ride—it’s going to take a a number of weeks. For now, let’s start with a brief introduction to that bastion of Western exceptionalism: the eugenics movement. Francis Galton had already been interested in heredity and statistics before he read Charles Darwin’s On the Origin of the Species upon its publication in 1859. The work, written by his half-cousin, acted as a major inspiration in Galton’s thinking on the way that genius was passed through generations—so much so, that Galton spent the remainder of his life working on a theory of hereditary intelligence. His first publication on the topic, “Hereditary Talent and Character” (1865), traced the genealogy of nearly 1,700 men whom he deemed worthy of accolades—a small sample of “the chief men of genius whom the world is known to have produced” (Bullmer 159)—eventually concluding that “Everywhere is the enormous power of hereditary influence forced on our attention” (Galton 1865, 163). Four years later, the essay inspired a full volume, Hereditary Genius, in which Galton utilized Adolphe Quetelet’s statistical law detailing a predictive uniformity in deviation from a normally distributed set of data points—the law of errors. Much like Darwin’s seminal work, Quetelet’s advancements in statistics played a critical part in the development of Galton’s theories on the hereditary nature of human greatness. Quetelet, a Belgian astronomer, was taken by his predecessors’ work to normalize the variation in error that occurred when the position of celestial bodies were measured multiple times. Around the same time—that is, in the first half of the nineteenth century—French intellectuals and bureaucrats alike had taken a cue from Marquis de Condorcet, who had proposed a way to treat moral—or, social—inquiries in a similar manner to the way the physical sciences were approached. Quetelet, combining the moral sciences with normal distributions, began to apply statistical laws of error in distribution to the results of anthropometric measurements across large groups of people: e.g., the chest size of soldiers, the height of school boys. The result, which effectively treated the variation between individual subjects’ measurements in the same manner as a variation in a set of measurements of a single astronomical object, was homme type—the typical man (Hacking 111–12). In 1889, Galton wrote, “I know of scarcely anything so apt to impress the imagination as the wonderful form of cosmic order expressed by the ‘Law of Frequency of Error’” (66). Six years earlier, in Inquiries Into Human Faculty, he declared that he was interested in topics “more or less connected with that of the cultivation of race” (17, emphasis added)—that is, eugenics—than simply the observation of it. 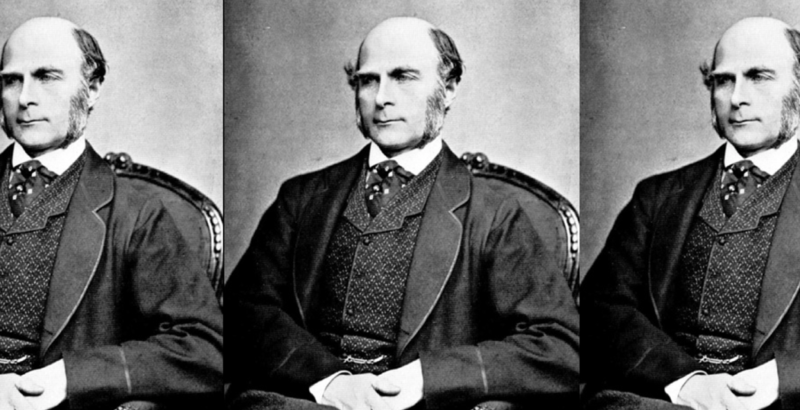 Galton’s argument was rather simple, albeit vague: society should encourage the early marriage and reproduction of men of high stature. Per Michael Bulmer, “He suggested that a scheme of marks for family merit should be devised, so that ancestral qualities as well as personal qualities could be taken into account” (82). Once these scores were evaluated, the individuals with top marks would be encouraged to and rewarded for breeding; at one point, he recommended a £5,000 “wedding gift” for the top ten couples in Britain each year, accompanied by a ceremony in Westminster Abbey officiated by the Queen of England (Bulmer 82). This type of selective breeding would eventually be referred to as “positive eugenics”. The statistical technologies developed by Quetelet and the like were utilized by Galton for more than just the evaluation of which individuals were worthy of reproduction, they also allowed for the prediction of how improvements would permeate through a population. Specifically, he argued that if a normally distributed population (being measured upon whichever metric—or combination of which—he had chosen) reproduced, it would result in another normally distributed population—that is, the bulk of the population would be average or mediocre (Hacking 183). He called this the law of regression and understood it to slow severely the improvement of a race towards the ideal. However, if one could guarantee that those individuals at the opposite end of the bell curve—that is, the morally, physically, or psychologically deficient—were not reproducing, then an accelerated reproduction of the exceptional could take place (Bulmer 83). Thus was born “negative eugenics”. I will revisit the proliferation of eugenics a bit later in this study, but it is important here to note that the historical trail of the active and public implementation of eugenics eventually goes cold somewhere between 1940 and 1945, depending on in which country one is looking. Most obviously, the rise of the Third Reich and its party platform built primarily on eugenicist policies had a direct effect on the decline of eugenics towards the midway point of the twentieth century. Previously enacted (and confidently defended) state policies regarding forced sterilization from Scandinavia to the United States were eventually struck-down and stay as embarrassing marks on national histories to this day (Hasian 140), though the last US law came off the books in the 1970s. This is not to suggest that the scientific ethos behind the field—that one’s genetic makeup determines both physical and psychological traits—went completely out of fashion. Instead, I hope it has becomes obvious, even in this brief overview, that the aforementioned analogies between eugenics and QS are not difficult to draw. But how do we get from one to the other? And am I being crazy in doing so? The second question is probably up for grabs for a little while. I’ll begin to answer the first one next week, however, when I sketch out a history of self-experimentation and behavioral psychology, moving backwards from the Quantified Self to eugenics. Come back again, won’t you? Gabi Schaffzin is a PhD student at UC San Diego. Having just returned from the east coast, his jetlag has left him without anything witty to add. Bulmer, M. G. Francis Galton: Pioneer of Heredity and Biometry. Baltimore, Johns Hopkins University Press, 2003. Galton, Francis. “Hereditary Talent and Character.” Macmillan’s Magazine, 1865, pp. 157–327, galton.org/essays/1860-1869/galton-1865-hereditary-talent.pdf. Accessed 17 Mar. 2017. Galton, Francis. Natural Inheritance. New York, AMS Press, 1973 (Originally published 1889). Hacking, Ian. The Taming of Chance. Cambridge, Cambridge University Press, 1990. Hasian, Marouf Arif. The Rhetoric of Eugenics in Anglo-American Thought. Athens, University of Georgia Press, 1996. Lupton, Deborah. The Quantified Self: a Sociology of Self-Tracking. Cambridge, UK, Polity, 2016. Neff, Gina, and Dawn Nafus. Self-Tracking. Cambridge, MIT Press, 2016. Interesting question. I would situate the Quantified Self within a history of scientific (or scientistic, if you will) health practices, Foucault's concept of subjectification, Taylorism (scientific management), and more recently, neoliberalism.